Raumfahrt+Astronomie-Blog von CENAP - Blog: Astronomie - Schöne Spekulation: FRBs durch Neutronensterne oder Alien Raumschiff-Antrieb? 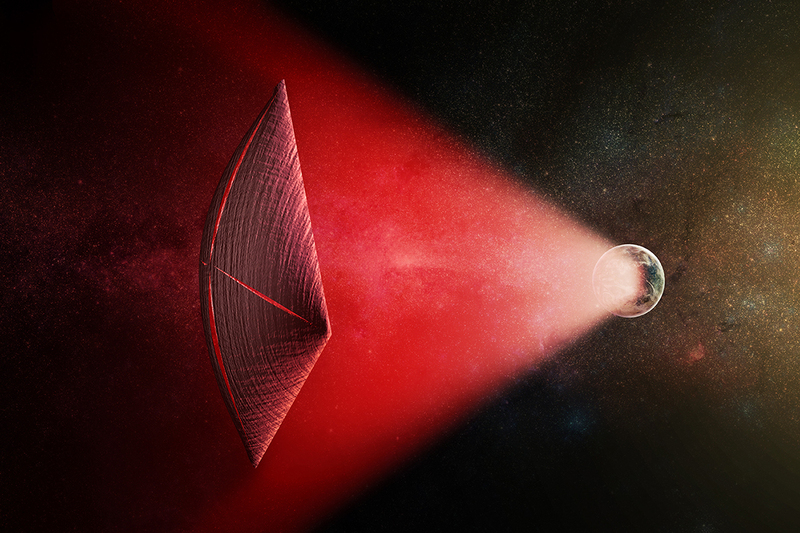 Could fast radio bursts really be powering alien space ships? Are alien radio beams causing one of the most mysterious signals from space? A new study by Manasvi Lingam and Avi Loeb at Harvard says that fast radio bursts (FRBs) could come from extraterrestrial radio beams being used as beacons or to power alien light sails. The source of FRBs, which are milliseconds-long but incredibly bright pulses of radio waves, have intrigued and mystified astronomers for years – and this isn’t the first time aliens have been suggested. No. There is no evidence that FRBs come from aliens. This new research isn’t saying that anyone found aliens or that aliens cause FRBs. Instead, it takes the scenario where these mysterious signals do come from extragalactic civilizations as a starting point, and asks how that could happen. Since we don’t know what actually causes FRBs, this work is simply adding another idea to the pile. Many astronomers find it unlikely, but Loeb argues it’s worth investigating anyway. If it was aliens, how would that work? According to Lingam and Loeb, FRB signals could come from enormous radio transmitters outside of our galaxy. If they were powered by sunlight, these alien transmitters would need to be twice the size of Earth. Why make the effort to build a planet-sized radio transmitter? If aliens are trying to signal that they’re out there, this seems like one of the more difficult and inefficient ways to do so. Instead, maybe they are using these powerful radio beams to power light sails, which push spacecraft along by bouncing light off a large, reflective sheet. A sail that requires a beam as powerful as an FRB would be much bigger than any we’ve ever considered making on Earth. Such an alien light sail could carry almost a million tonnes – in contrast, the International Space Station only weighs about 420 tonnes. If there were many extraterrestrial civilizations with colossal alien cruise ships, there could be many powerful radio beams sweeping through the sky, each following the path of a sail. When the beam’s path intersects with the Earth’s, we’d see a bright but fleeting burst of radio waves. If fast radio bursts aren’t alien signals, what are they? Since FRBs probably come from extremely far away, they must come from extraordinarily energetic and bright sources. So most proposed explanations involve the most extreme objects in the universe, neutron stars and black holes. One theory holds that as a neutron star and a black hole orbit one another and spiral inward, their interacting magnetic fields generate electricity, lighting up the area in radio waves. Just before the two behemoths merge, that light flashes, causing the radio bursts that we see. Or maybe FRBs come from neutron stars in the process of becoming black holes. If a supernova left behind an overweight neutron star, only its fast rotation would stop it from immediately collapsing into a black hole. Eventually, though, the neutron star has to give in to gravity. When it does, its magnetic field may be severed, releasing a burst of energy – maybe in the form of an FRB. One FRB appears to repeat, which throws a wrench into the idea that they must come from cataclysmic one-time events. Repetition could point to “something like a pulsar on steroids”, a rotating source that occasionally emits bursts of radio waves in our direction, said Jason Hessels of the Netherlands Institute for Radio Astronomy, who was part of the team that discovered the repeating FRB. It’s also possible FRBs are caused by a combination of things, or by something else that nobody’s thought of yet. We’ve only seen 17 unique FRBs so far, so it’s hard to say with any confidence what causes them. So… it could still be aliens? Well, nobody has proven that it definitely isn’t aliens or that it definitely is any other source… So technically, yes, it could still be aliens. We’ll leave it to you to decide how likely that is.